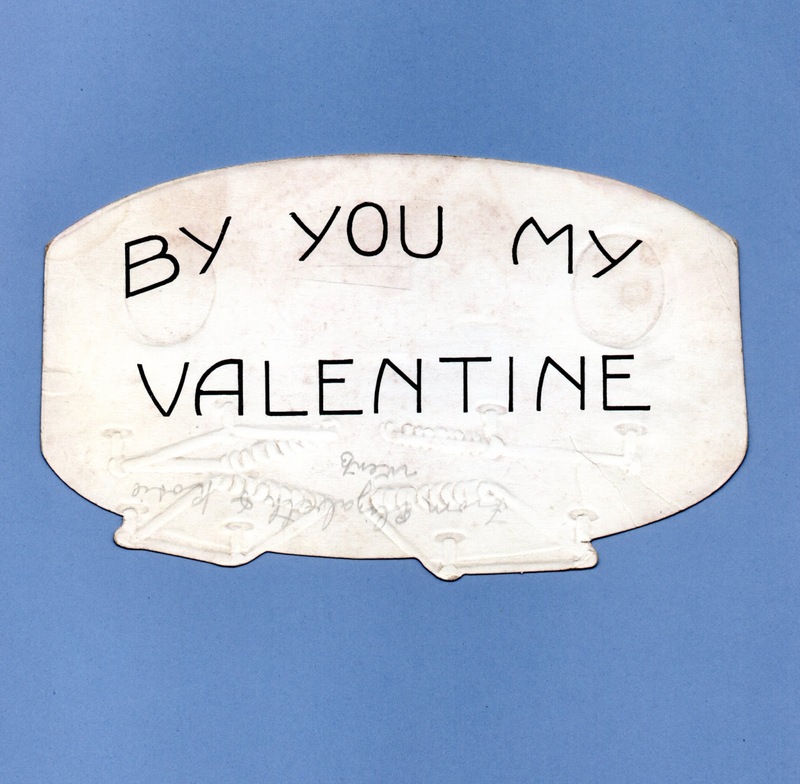 To My Valentine - It's a CRACK-UP but I'll stick to You. 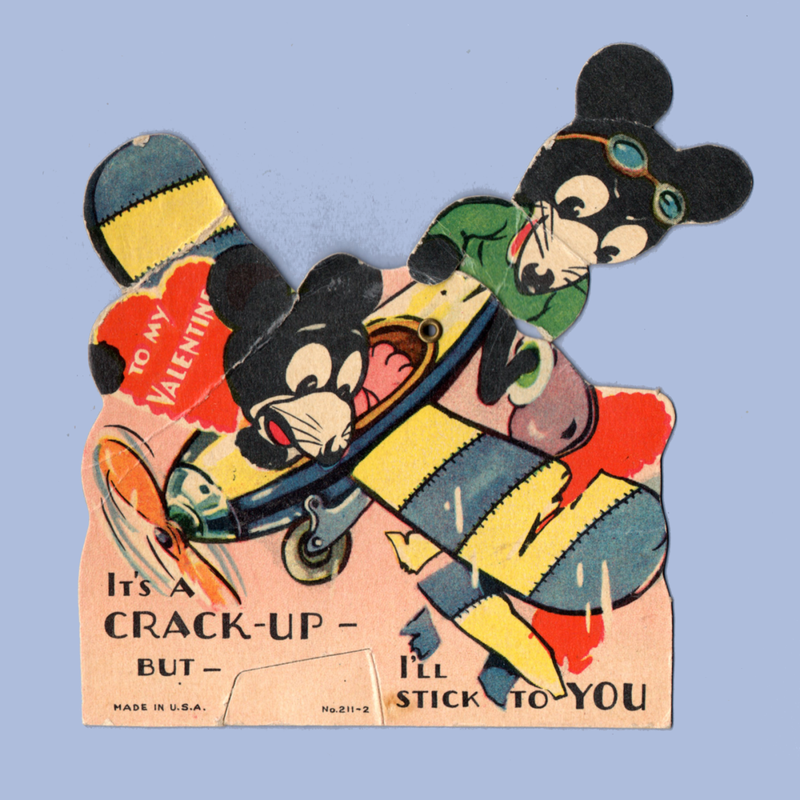 The popularity of both Disney's Mickey Mouse and George Herriman's Krazy Kat led to an awful lot of valentine graphics in the 1920s through the 1940s featuring little black mice. Most of these are not officially associated with either Mickey or Herriman's Ignatz character, but rather are other artists jumping on the bandwagon of a popular cartoon figure. From the beginning Disney was keen on marking his creations as part of his 'brand', so even the very early cards featuring his characters are marked (usually with a WDP for Walt Disney Productions along with a date). Herriman was not so inclined, so the cards that get identified as Ignatz are not necessarily marked as such - perhaps none are. Given that he started his comic strip in 1913 (1910 if you count the characters' debut in The Dingbat Family strip) when such markings on cards were not the norm in the industry as became the case later on, this wasn't unusual. It does make it harder to know for sure if a particular mouse on a card is really meant to be Ignatz or is merely an imitator riding Herriman's coattails. It is even possible that there were no officially released valentines with Herriman's characters, just a lot of copy cats doing a really good job at evoking his style. While Herriman's strip was long-running, it was never as wildly popular as Disney's work. Rather, his comic was very popular within a certain creative class, having quite an impact on other artists within the comic field and beyond. 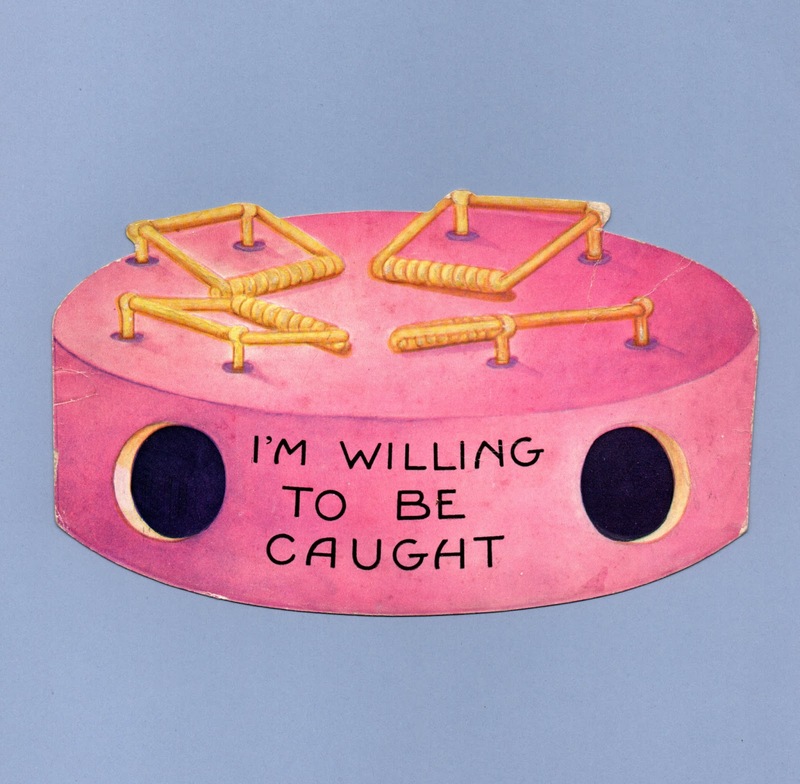 Even someone as successful as Charles Twelvetrees made quite a few cards with mice in the mid-1930s to mid-1940s. His mice are definitely a bit more "stick-like" in how they were drawn than say his dogs, elephants or other animals. That's not to say he was "ripping off" these characters, but rather following a trend. This type of "borrowing" can be found elsewhere in the greeting card industry too (and beyond - what we see done in cards is nothing compared to the copying rampant in the glass collecting field for example). At the time, I suppose the odds of being caught at this were relatively low and copyright laws prior to the 1930s were not what they are today even if one were nabbed. Plus, there is certainly nothing illegal or even necessarily unethical with an artist recognizing that people like little black mice with skinny legs and big shoes and then drawing their own take while the fad lasts. It's a fine line between homage and outright copying - and Disney was smart to see to it that his version could always be distinguished from the pack. Goodness Gracious My-Oh-Me! 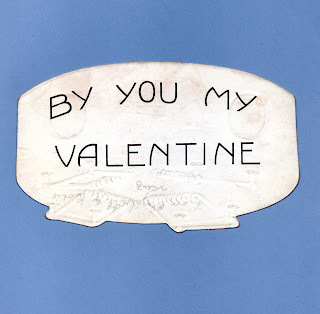 I like you lots, that's plain to see Be my Valentine. 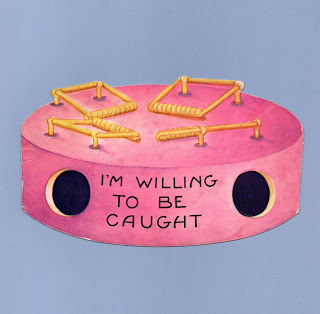 I'm willing to be caught (reverse) By you My Valentine.